“I don’t want to price our home above the values of the other homes on my street.” “We’re only going to live in this house for another four to five years.” “I’m not planning to get new cabinets. Ours are made of perfectly good quality oak.” These are some typical comments from prospective clients. Sinking too much money into a house can result in diminishing returns. In addition, home values in Connecticut, as well as nationally, have decreased over the past decade. However, kitchen/bath remodeling is still a good investment for resale. 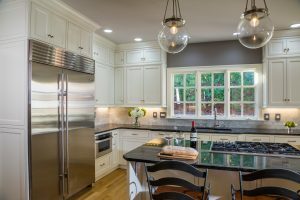 According to Remodeling Magazine, the average complete costs for a mid-range kitchen renovation vs. an upscale kitchen renovation in the Hartford, CT area in 2018 were $68,025 and $133,458, respectively and $21,350 and $65,896, respectively, for mid-range vs. upscale bathroom renovations. Then, further results indicated that the resale values of these homes increased accordingly, as follows: mid-range kitchen remodel + $31,327 (46.1%), upscale kitchen remodel + $58,520 (43.8%), mid-range bathroom remodel + $12,000 (56.2%) and upscale bathroom remodel + $25,955 (39.4%) upon completion. Let’s say that a couple own a house in Avon, CT that is worth $500,000, where the median home price is currently $372,400, according to Zillow . Hence, this couple have a more upscale home than the median priced home. So, for the sake of argument, let’s say they invest in a new mid-range kitchen for $68,025, to use the above figure. So, adding this amount to the home’s $500,000 current value would yield a new value of $531,327. So, in actuality, it’s as if they only spent $36,698 ($68,025 – $31,327) , based on the above figures. most likely, the home will increase some in value over the five years, as well. After the five years, let’s say they sell the house for $550,000. 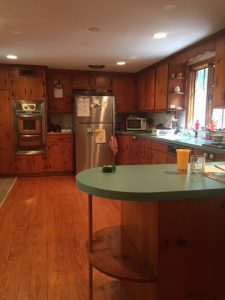 Now let’s compare the above scenario to couple two, also owning a home currently valued at $500,000, who decide to keep their thirty-year-old oak cabinets and Corian countertops from the 1980s, not wanting to spend the money to update their kitchen. So, they spend the next five years with their tired, dated look, a mediocre layout, sticking drawers, lots of bending over and poor lighting. Then comes the real bomb when they put their house up for sale and after five months on the market, somebody offers them $425,000, because they would certainly have to remodel the kitchen upon moving in. The owners finally agree to sell the place at the deflated price. Do the math. Which couple do you think was happier in the end? Why not invest and enjoy at the same time? If you’d like to inquire about a new kitchen or bathroom, contact us today at 860-470-7987.